Congratulations to second-year graduate student Tetyana Pyatovolenko who has been selected as a 2015-16 Classical Music Student Ambassador Leader. 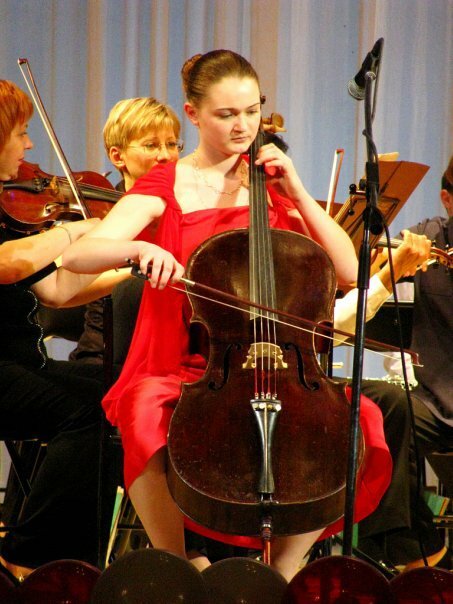 She is a cello student of Kim Cook. A native of Dnepropetrovsk, Ukraine, Tania is the daughter of Igor and Olga Pyatovolenko. She received her undergraduate degree in 2014 from Messiah College. Tania made her solo debut with Dnepropetrovsk Philharmonic in Ukraine in 2010. She was the prize-winner of the International Music Competition in Zaporozhye and performed as a soloist at the Dnepropetrovsk Organ Hall at the age of sixteen. Tania's creativity and innovation in and beyond the concert hall makes her an avid advocate for arts. She has worked for a concert series sponsored by the National Museum of Art in Washington, D.C. and the Market Square Concert Series in Harrisburg, PA. She is a member of American Business Association (ABWA), an active fundraiser of non-profit organizations, and has gave multiple performances in nursing homes and rehabilitation centers in Maryland and Pennsylvania. As a student ambassador leader, Tania hopes to “serve as link between classical music and different audiences in order to make it possible for Penn State's students and community to be enriched.” She believes her greatest assets in this role will be her ability “to connect with people,” along with her creativity and passion for music. The Classical Music Project Student Ambassador Leader Program was developed in fall 2014 as a partnership between the Center for the Performing Arts and the School of Music. Classical Music Student Ambassadors—selected for their musicianship, leadership, and commitment to music advocacy—are provided with residency training and are charged with creating and implementing student-centered engagement and music advocacy programs. The work of the ambassadors is supported in part through a grant from the Andrew W. Mellon Foundation. The student ambassador leader program is coordinated by Robyn Dixon Costa.